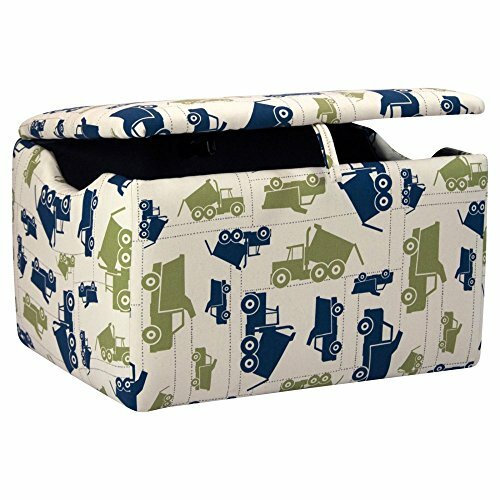 Give your little trucker's bedroom a loader full of style with the charming and convenient Kidz World Toy Trucks Felix / Natural Upholstered Storage Box. The durable wood frame is padded and upholstered in a darling truck-print fabric, so it's cushy enough to double as seating. With ample storage for his toys and games, it also features air openings on the sides for safety. Dimensions: 28W x 20D x 16H in.. Sturdy wood frame, spring-loaded lid support. Upholstered in truck-print fabric. Air openings on side for safety. Doubles as seating. For ages 4 and up.